Named after Alfred Nobel, nobelium was first synthesized by a group of scientists, Albert Ghiorso, Glenn T. Seaborg, Torbørn Sikkeland and John R. Walton working at the Lawrence Radiation Laboratory in Berkeley, California in 1958. 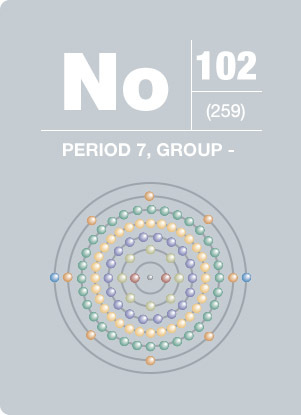 With a half-life of about 58 minutes, nobelium’s most stable isotope is nobelium-259. The primary decay mode prior to the nobelium- 259 isotope is alpha emission, and the primary mode after it is spontaneous fission. Nobelium has no known uses outside the laboratory because little is known about the element and only small quantities of it have ever been produced.